But she was powerless to implement the order. The Court’s innovative remedies required judicial as well as executive action. Two days after Bachelet’s declaration, the President of the Chilean Supreme Court stated in a press conference that the Inter-American Court’s ruling was not binding. 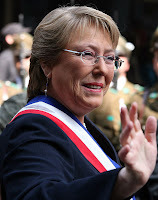 Bachelet’s term ended over a year ago, and the Chilean judiciary has yet to prosecute a case closed under the amnesty. Almonacid, then, represents the defeat of an international court order at the hand of a national court. The Inter-American Court, based in Costa Rica, was rebuffed by Chile’s weakest branch. What’s more, this is business as usual in the Americas. Scholars of international relations assume that autonomous national courts heighten compliance with international human rights regimes. But the Inter-American Court’s ongoing experiments with innovative equitable remedies provide a different perspective. ► First, in a majority of its contentious rulings the Inter-American Court demands that some sort of prosecutorial or judicial action be taken, such as an investigation, a hearing, or a trial. ► Second, the judges and prosecutors of Latin America rarely comply. Latin American constitutions grant prosecutors autonomy from the executive, much like that of judges, to ensure accountability. But judges and prosecutors are far less likely to undertake the actions demanded by Inter-American Court rulings than are executives. While states implement the majority of orders that primarily require executive action, they implement only one in ten orders that invoke action by justice systems. Nor is the problem a lack of judicial independence. My article draws on original data to reveal a different – and often primary – reason. Implementation of orders involves actors whose interests, ideologies, and institutional settings differ from those of the executive. These non-executive actors may be only dimly aware of the Inter-American Court. Prosecutorial and judicial politics must be viewed as separate, vital factors in explaining the performance of supranational rights regimes and in devising strategies to enhance their effectiveness. Drawing on this insight, my article also argues that the Inter-American Court – and international human rights courts more generally – could increase compliance by more directly engaging national judges and prosecutors. In short, human rights courts should deliberately cultivate national justice systems as partners in compliance. The argument holds relevance beyond the Inter-American system. The analysis is also relevant to the European and African regional human rights systems. While neither system has a remedial regime as intricately developed as that of the Inter-American system, motivating national justice systems to act – and to learn of and care about regional rights law – is important for both systems’ future success. To explain compliance patterns to human rights regimes, then, we need to pry open the black box of domestic justice systems and examine the motives and institutional settings of judges and prosecutors. One tool that the Inter-American Court has at hand is its self-styled remedial regime which, coupled with the Court’s supervision of compliance to its rulings, establishes a link between the Court and particular state actors. This link provides a unique opportunity, so far underutilized, to deepen relationships with actors beyond the executive and to shape those actors into compliance partners. My article is the first to be published in an ongoing study of the Inter-American Court’s remedial regime in comparative perspective. It aims to straddle disciplines, speaking to debates in both political science and law. Very interesting article. I would recommend you to follow the case of López Mendoza vs. Venezuela from the IACHR (2011). It is very recent and although the Court ordered the electoral authorities to allow Mr. López Mendoza to run for public office, it is very obvious that such authorities won't allow it since all the branches of government are under the direct command of Hugo Chávez. It is expected that in this case, the Supreme Court issues a ruling declaring unenforceable the decision from the IACHR. In other similar case, three years ago, the Supreme Court even requested the President to denounce the Inter-American Convention of Human Rights.